Sciency Thoughts: NGTS-1b, a Jovian Planet in a Red Darf star system. NGTS-1b, a Jovian Planet in a Red Darf star system. 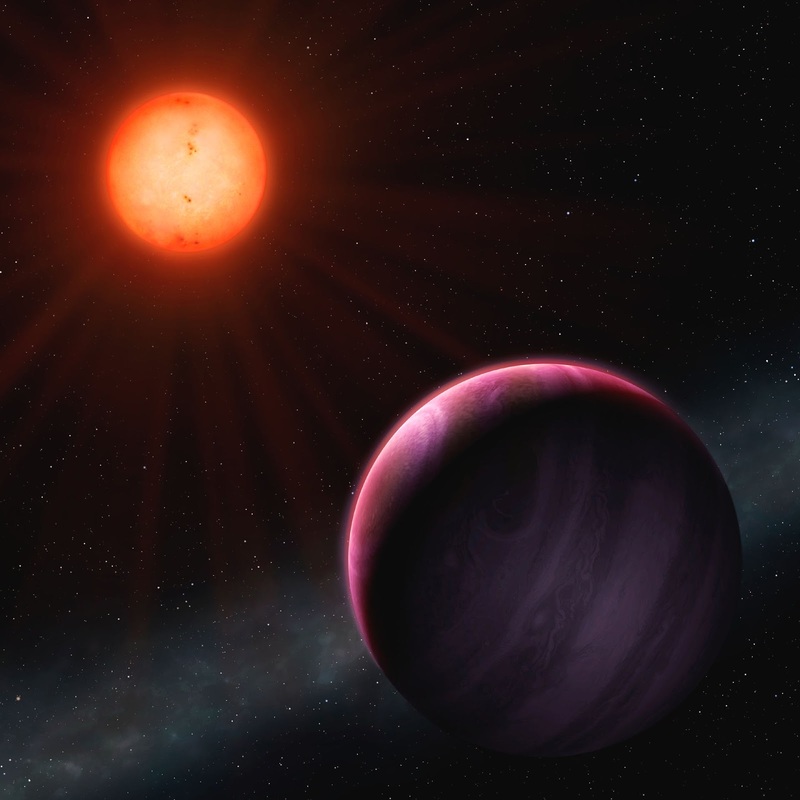 Red Dwarfs (or M-Dwarfs), stars with a surface temperature of less than 4000 K (compared to 5778 K for our Sun), which typically indicates a star with half the mass of our Sun or less, are the most abundant stars in the Universe, and of great interest to astronomers searching for exoplanets. 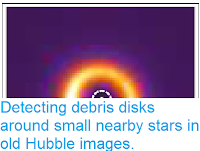 Because Red Dwarfs are small, any planets orbiting them will be proportionately large, making them easier to detect by both the amount of light it blocks as it passes in front of the star, and by the extent which they move the host star as they orbit it (strictly speaking, both a star and a planet gravitationally bound to it orbit their common centre of gravity; for most planets this has very little effect, as that centre of gravity will be very close to the centre of the star, but when planets have masses that are significant proportions of those of the stars they orbit, then the planet can cause the star to wobble to a significant degree, making it possible for astronomers to detect it). The small size of Red Dwarfs also means that their habitable zone (zone in which planets might have liquid water on their surface, making them potentially habitable for recognisable life-forms) is closer to the star, where planets are more easily detected. Most planets discovered in Red Dwarf systems are quite small, with masses four times that of the Earth or less, which is interesting, as most planets discovered around larger stars are Jovian (close in size to the planet Jupiter) or SuperJovian (significantly larger than Jupiter) worlds, making it possible that the formation of such large planets around small stars is somehow more difficult than around larger stars. 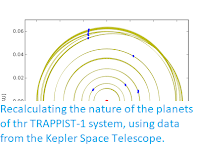 In a paper published on the arXiv database at Cornell University Library on 30 October 2017, and accepted for publication in the Monthly Notices of the Royal Astronomical Society, a team of scientists led by Daniel Bayliss of the Observatoire de Gen eve at the Universit e de Gen eve, describe the discovery of a Jovian planet orbiting the Red Dwarf Star 2MASS J05305145-3637508, 600 light years from Earth in the constellation of Columba. 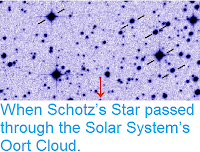 The discovery was made by the Next Generation Transit Survey (NGTS), a fully automated array of twelve 20 cm aperture Newtonian telescopes situated at the ESO Paranal Observatory in Chile, and the star system is renamed NGTS-1 (i.e. 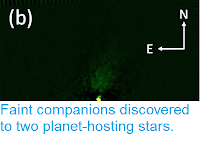 the first planet hosting star system discovered by the Next Generation Transit Survey), with the star becoming NGTS-1A and the planet NGTS-1b (when naming objects in other stellar systems stars are indicated with an upper case letter, and planets with a lower case letter). 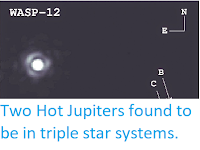 An artists impression of the NGTS stellar system. Mark Garlick/University of Warwick. NGTS-1A has an effective surface temperature of 3916 K, a mass 0.617 times that of our Sun and a radius 0.573 times the Sun's. This star is orbited every 2.65 days by NGTS-1b, a planet at a distance of 0.326 AU (i.e. 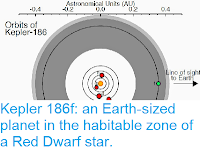 0.326 times as far from the star as the Earth is from the Sun) with a mass 0.812 times that of Jupiter, and a radius 1.33 times Jupiter's; this larger radius being due to the high temperature of the planet, which has a surface temperature of 790 K, due to its close proximity to its star. Eruptive Activity on Great Sisken Island. Asteroid 2017 WG28 passes the Earth. Asteroid 2017 VC14 passes the Earth. Fireball over Saitama Prefecture, Japan. Asteroid 2017 VN13 passes the Earth. Asteroid 2017 VV12 passes the Earth. Magnitude 6.4 Earthquake in eastern Tibet. Asteroid 2017 VF14 passes the Earth. Asteroid 2017 WD passes the Earth. Eruption on Mount Dempo, Sumatra. Fragments of metorite found in British Columbia,. Saboteurs target oil pipeline in Bahrain. Measles outbreak in Bolivar State, Venezuela. Asteroid 2017 VD passes the Earth. Asteroid (503941) 2003 UV11 passes the Earth. Magnitude 6.8 Earthquake between Tonga and Samoa. Asteroid 2017 VA passes the Earth. Asteroid 2017 UL6 passes the Earth.